Version 18.10 is now available for DOWNLOAD! This release is packed with fixes and improvements in many areas! Added Settings > Video Mode > Custom > Remove…. Added View > Layout > Remove…. Fixed changing position or removing advanced keyframes for the Scale parameter of the Rotate and Scale filter distorting the aspect ratio of the image. The minimum macOS version has changed to 10.12. Version 18.09 is now available for DOWNLOAD! UPDATE: Version 18.09 has been re-released (build 18.09.16) to fix major new bugs with the Rotate and Scale, Size and Position, Text, Chroma Key, Key Spill, and White Balance filters. Added Ripple support for moving clips including Ripple All Tracks. When Ripple is on and you move a clip to the right, it now ripples (pushes) all the clips to the right instead of making a transition (including the Ripple All Tracks option). Improved Snapping behavior on the Timeline. Added Ctrl+P keyboard shortcut to toggle Snapping. Added Reset Track Height (Ctrl+0) to the Timeline menu. Added a Timer video filter. Added support for negative rotation to the Rotate and Scale filter. Added Shake 1 Second - Scaled and Shake 1 Second - Unscaled presets to the Size and Position filter. Added a Text clip to the Open Other dialog. This is a convenience item that creates a transparent Color clip with a Text filter. 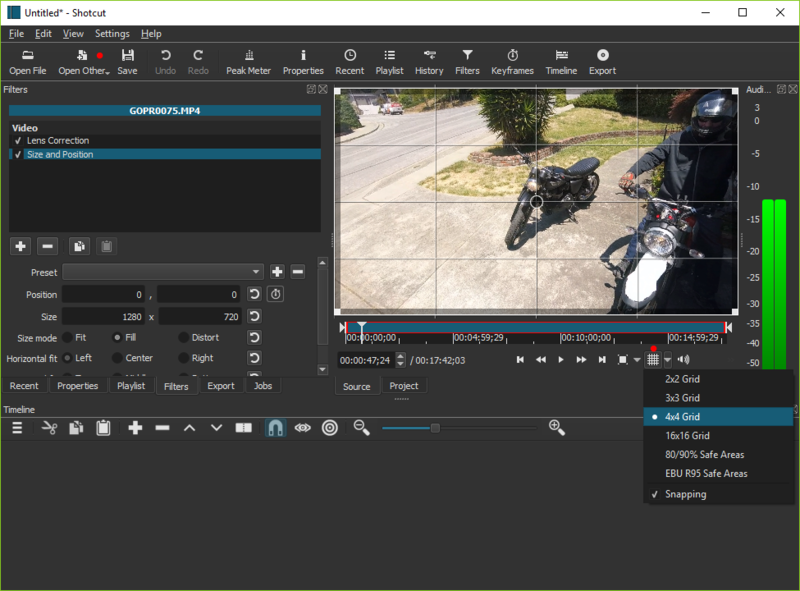 Added Extract Sub-clip to Properties menu for audio/video clip. Added Export presets for WebM VP8 and VP9 with alpha channel. Fixed a crash when quickly changing clip selections in the Timeline. Improved closing Shotcut more reliably and the behavior of multiple shotcut processes. Fixed Undo beyond Remove Track may crash. Fixed a crash when moving a clip after undoing a transition. Fixed a crash loading project after some sequence of inserting and removing tracks. Fixed a crash loading an image with the wrong filename extension. Fixed OS audio device changes may cause Shotcut to hang. Fixed crash dragging simple keyframes beyond the edges of the clip. 3 GiB on 32-bit Windows and 4 GiB on 64-bit Windows. Fixed a crash applying an image transform filter to an image with alpha channel (PNG, SVG). Improved behavior of opening WebP images. Fixed advanced keyframes for the Size and Position filter. Fixed inserted and then hidden video tracks become audio tracks after re-opening the project. Fixed changing Video Mode from Automatic to something else with nothing opened. Fixed moving a transition to another track leaves a hidden clip on the old track. Fixed trimming the out point of a timeline clip may change the in point of the following clip. Fixed Properties > Speed, Convert, Reverse, and More Information does not work sometimes after reloading a project. Fixed reliability of changing size and position fields with keyframes in Size and Position and Text filters. Fixed trimming outward with Ripple All Tracks moved clips on other tracks in the wrong direction. Fixed audio waveforms still appear on muted tracks after adding a track. Fixed edges of text with the Text filter may get cut off (clipped). Fixed Size and Position and Rotate and Scale filters may leave black right and bottom edge of frame. Fixed trimming a timeline clip with Fade In/Out Video filters with “Adjust opacity instead of fade with black” enabled. Fixed Export may change the actual frame rate and cause timing errors. Fixed reducing the Frame/sec in Export causes timing errors in the output. Removed the Compositing toggle icon from the Timeline track head. Now, it is located in the track Properties as Blend mode with a None option. In the 3D Text filter, replaced the Droid fonts with Liberation due to an incompatible license. Well, to be honest, there is not much speed improvement. Most of the improvement comes from a fix to prevent an incomplete shutdown. In the case of the 32-bit Windows build, since more memory can be accessed now, we have removed some of (not all) multi-threading limits. Improved the performance of changing filter parameters and scrubbing. Limit the number of background thumbnail and waveform generation threads to 4. Prevent trying to generate audio levels for waveforms for still images and other silent sources. Version 18.08.14 is now available for DOWNLOAD! Locate every line with <property name="shotcut:comment">. Try to load the repaired XML file. Version 18.08.11 is now available for DOWNLOAD! Fixed new crash in v18.08 changing Settings > Video Mode with nothing opened. Fixed crash while adjusting position or size in Text and Size and Position filters. Fixed position and size information incorrect if resolution or aspect ratio changed in Export. Fixed Text animation (keyframes) when not the first clip in the timeline. Fixed track name not editable after the track head had been selected at least once. Fixed right-clicking a timeline clip breaks automatic timeline scrolling during playback. Added Quicktime Animation Export preset to export video with alpha channel. In Export, let option values in Other tab override values generated by other fields. Version 18.08.01 is now available for DOWNLOAD! Added the timecode of failure to the Jobs panel when an export job fails (makes locating problem areas in the project easier). Added an Unpremultiply Alpha video filter (handy to fix compositing for video clips with an alpha channel that has had its color pre-multiplied with its alpha). Fixed various crash regressions since v18.05. Fixed audio distortion during preview (regression in v18.07). Fixed custom Export presets broken if name contains parentheses (regression in v18.07). Fixed Properties > Reverse… broken if numeric region setting uses comma for decimal (regression in v18.07). Fixed Timeline > Copy Timeline to Source > Export fails on unsaved (Untitled) project. Fixed Text filter has aliased edges (regression in v18.07). Fixed Stabilize video filter not available on Linux (regression since v18.06). Fixed changing Speed in Properties breaks all filters on that clip (regression since v18.05). Fixed Fade Out Video (and keyframes in general) broken on still images whose in point is > 0 (regression since v18.03). Fixed accuracy of Properties > Duration for image clip on the timeline. Some fixes for changing Settings > Video Mode after starting a project. Fixed compositing of upper video tracks becomes broken if bottom video track is deleted. Fixed images with alpha channel (e.g. PNG) on upper video tracks have dark edges after compositing if the Size and Position or Rotate and Scale filters are not used.